Batman’s corer of the DC mythos possesses some of the coolest concepts in all of comics. From the incredibly versatile utility belt, to the badass Batmobile, to the infinitely iconic cape and cowl, the man knows how to stand out. However, one of the coolest aspects of Batman’s lore is his subterranean lair known as the Batcave. It’s a place we’ve always wanted to visit, and thanks to Google Maps, we finally can. As part of the promotion for Batman V Superman: Dawn of Justice, Google Maps (h/t Geek Discover) has just added the Batcave to its system as an explorable location. In order to check out the fictional locale, simply type “Bruce Wayne’s Residence” into Google Maps, and select “Street View.” This will lead to the online app dropping users into Batman’s lakeside residence from Dawn of Justice, and allow them full exploration of the premises. If used properly, the app will let users explore not only the incredibly fancy upstairs portion of the property, but navigate downstairs to his crime fighting headquarters. Everything one could expect to find in the Batcave can be seen, from uniform of a dead Robin, to the Batmobile primed and ready for action, to a glimpse of the Caped Crusader’s extensive arsenal in the background. Our inner nerds have never felt so happy to be using Google Maps. The Batcave represents one of the elements from Batman V Superman: Dawn of Justice that we would like to have seen fleshed out more. We remain hopeful that a future Batman solo film will explore that lair more, giving us insight as to how Bruce Wayne built it, why he ever left Wayne Manor, and what other secrets could possibly be waiting for us down there. It’s a fictional locale that has changed time and time again over the years, and one that never stops grabbing our interest. 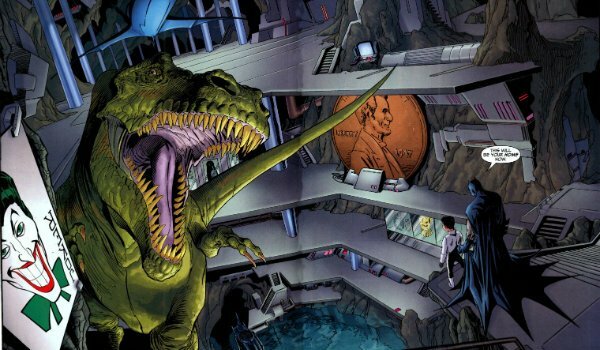 Perhaps a future DCEU movie will even show that Batman has a giant dinosaur and an enormous penny hidden somewhere as a reference to Batman: The Animated Series. If you’re a self-respecting Batman fan, be sure to check out Bruce Wayne’s residence on Google Maps. We absolutely love what Zack Snyder has done with the Batcave, and we cannot wait to see how it evolves as the DCEU goes forward. Be sure to check out Batman and the Batcave in Batman V Superman: Dawn of Justice, which is currently closing out its absolutely insane opening weekend. Stay tuned for more details!